1 Packet each of Amaranthus Lalit, Bitter Gourd Gori and Hot Pepper Kanthari. 1 Packet each of Okra Burgundy, Bush Bean Royal Burgundy, and Yard Long Bean Red Noodle. 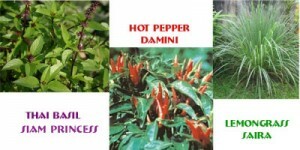 One packet each of Thai Basil Siam Princess, Thai hot pepper Damini, & Lemongrass Saira. One packet each of Val Papdi Bhavna, Usha Yard long bean, and Rajasthan Gawar Bean. We cannot ship this product to Australia. 1 EA OF BRIDE, HARI AND RHIM JHIM EGGPLANT SEED PACKETS! 1 EA OF RHIM JHIM, SHYAMALA, AND SWAPNA EGGPLANT SEED PACKETS! 1 EA OF BAHADUR BITTER GOURD, ALOK BOTTLE GOURD AND JAYA TINDA GOURD. 1 EA OF GANGES ASH GOURD, JAYA TINDA GOURD AND JAWAHAR BITTER GOURD. 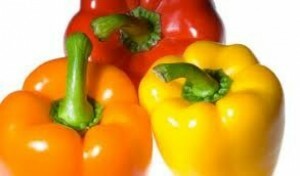 Did you ever price the cello 3 pack of yellow, red and orange bell peppers in your local supermarket? Why pay more? Grow healthy and colorful bell peppers in your back yard. Brightly colored bell peppers also known as capsicums, whether green, red, orange or yellow, are rich sources of some of the best nutrients available. To start, peppers are excellent sources of vitamin C and vitamin A (through its concentration of carotenoids such as beta-carotene), two very powerful antioxidants. One Packet each of Sona, Narangi and Lalbagh Bell Pepper.